Before my art, I was only emotion…raw emotion with no outlet. My youth was filled with a great sense of wonder for all things hidden, abandoned and forgotten. Growing up in the suburban ruins surrounding Detroit, I spent countless hours exploring abandoned farmhouses, barns, sheds, factories, and hospitals…I searched the night skies and the occult for some divine meaning, it was then that I learned my outlet. My work is a perfect blend of emotional obstacles and my lifelong search for divinity that I know will someday reveal itself to me. This creative regurgitation is a form of divination. I received my Bachelors in Illustration from The Savannah College of Art & Design. I work in acrylic with oil washes until recently, I work primarily in oil now. I enjoy light carpentry to create my frames and hope to someday master woodcarving and mold casting. 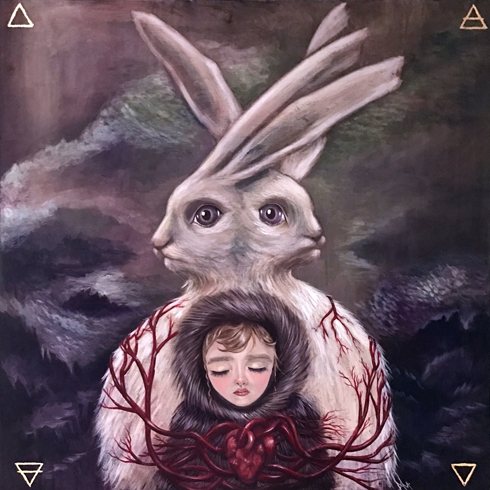 My inspiration comes from Northern Renaissance paintings, Pop-Surrealism and the occult. I do not feel my work is complete or reveals its true form until it is has been aged. Like stumbling upon something hidden from eyes wide open, I want the viewer to feel as though my work has just been unearthed for them to find the divinity within it.